The Importance of Checking Your Free Credit Score - Winningback | Shopping and Finance Blog, Reclaim your finances today! A quick search on get free credit score will pull up several options, including the service offered by creditexpert.co.uk. Credit expert is run by Experian, the largest credit reference agency in the UK. When you get free credit score you will be able to get an idea of how your credit report looks to lenders, but just what is your credit report and why is it important? Your credit report is a compilation of the information that previous lenders and other credit providers hold about you, and how you have managed credit accounts with them in the past. Credit reference agencies help lenders share this information, by bringing it all together in one place. Lenders then access your credit report when you apply for their products, and use this information, together with that which you provide on your application form, to carry out a credit scoring process. The free credit score provided by CreditExpert is designed to indicate how you might fare in a credit scoring process, but each lender has their own credit rating systems, and so your free score is not universal and definite, but an estimation. Credit scoring is a way of rating each piece of relevant piece of information available to the lender, with a view to determining whether or not your application for a new credit account should be successful. A history of problems, like late or missed payments, will obviously have a negative effect on the average credit scoring system, but there are also less immediately obvious issues that can stand in the way of you being able to open a new credit account. You may well have never missed a payment in your life, but still receive a refusal for an application. This can simply be due to your overall exposure to debt. If a new lender sees – or more accurately, an automated credit scoring system determines – that you already have enough debt on your plate, the concern may be raised that you might run into problems in making repayments towards a new credit account. To complicate matters, this problem can often arise due to having old accounts, which are no longer in use, but still open. For example, thanks to the way that the bureaucracy has been streamlined, many people now switch bank accounts much more often than they used to. A standard precaution during the transfer process is to leave the old account open, just in case any problems occur. However, many of us continue to leave the old account open after the new one is successfully set up, and if this means leaving an unused overdraft facility still active, you have another potential source of debt to be factored into a credit scoring process. Another common cause of this problem is keeping old credit card accounts open, well after the balance has been paid off, and you have moved on to using a new product. 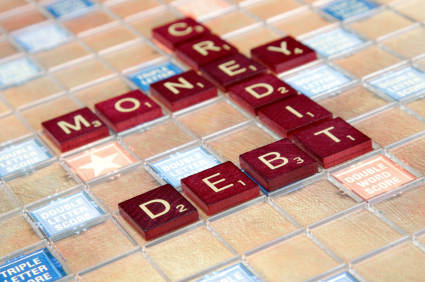 Looking at your credit report is often the easiest way to identify these potentially problematic dormant accounts. To get an idea of the other issues that can lead to a low indicative credit score, and the need to look more closely at your credit report, look here: http://www.moneysavingexpert.com/loans/credit-rating-credit-score.